Horrible Histories is a series of books from the UK that takes a comedic look at history, complete with cartoons and terrible puns. Typically they are in the form of trade paperbacks, but this special book is about the size of picture book with color illustrations. I picked it up because, for no reason whatsoever, I felt like learning more about the English Civil War, so it seemed like a safe bet. First of all, this is a book from the UK, so there are many times when I had to re-read a sentence because I wasn't quite sure what it meant. Sometimes they would clarify with footnotes ("Adam-and-Eve'n it" is Cockney rhyming slang for "do you get it? "), sometimes they wouldn't. For my particular audience this is problematic. * How am I supposed to teach students who barely have a grasp of English what the difference between American, Canadian (eh?! ), and British English is? Especially in written form, where their reading comprehension is lacking. Add the really dry British humor of this book (think a child-friendly version of Monty Python) and maybe this book isn't the best idea for younger students at a school in Bangladesh. That being said, I really enjoyed the book. The cartoons, which are painfully punny at times, still made me laugh, and the full-color illustrations throughout were fun to explore. If I have one problem, it's with how quickly they blow through 30,000 years of prehistory, one spread of pages and that's it. Same with the Romans conquering all of England, nothing about how that entirely changed the world. I was also confused about how they separated things. First they would have a short timeline, then a small digression. For example, they had a timeline of the Roman invasion** and then they had three stories of British invaders. Which was interesting, but confusing because they jumped way ahead in the story. Good for my library? Yes, definitely, but probably for a little older kids with a firm grasp on their English language skills. England, or Britain depending on who and when you ask, has been invading, being invaded, squabbling over land rights, squabbling over who's supposed to be leading them, and generally causing a ruckus since time immermorial. In this brief horrible history, learn more about tragic leaders, such as the Slimy Stuarts, the Terrible Tudors, the Rotten Romans, and all those Brits who have generally been a nuisance to everyone. 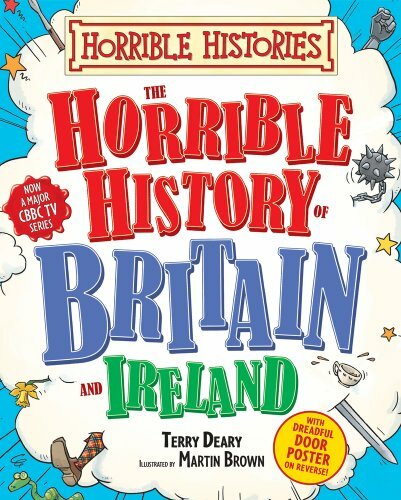 Horrible Histories, a series that prides itself on uncovering the worst about their subjects, brings us this concise book about the history of Britain, Ireland, and sometimes Wales. They use full-color, richly-detailed illustrations and cartoons to poke fun of their own history, while still sharing fascinating stories of British rule. For those unfamiliar with British slang, it might be a bit confusing at times, and the tendency to jump from one topic to the next could be confusing for some reader. Overall, this is a fairly good introduction to such a vast history in a package that is very accessible to students Grade 6 and above. *Because Bangladesh was formerly a part of the British colonial empire, they do use British terms for some things. However, it is rather outdated British terms, at least according to a student who grew up in London. For example, the toilets are for "Ladies" and "Gents." **I typed evasion instead of invasion first, which made me picture a giant group of Roman centurions (like unto Rory in Dr. Who) standing at Hadrion's wall evading a question. "Oh no, we're not going to invade, we just wanted to have tea here on the border, in our uniforms"
that Bangladesh is home to the second largest gathering of Muslims, called Biswa Ijtema. As it has been described to me, it is like Hajj, but for those who are unable to get to Mecca. There are at least a million people who descend on Dhaka (well, really, Tongi, which is north of Dhaka). As if Dhaka wasn't crowded enough as it is. leaving the chair lying on its side. Traffic, traffic, everywhere, and it all really stinks.